Choosing the right brake pad can some times be difficult. 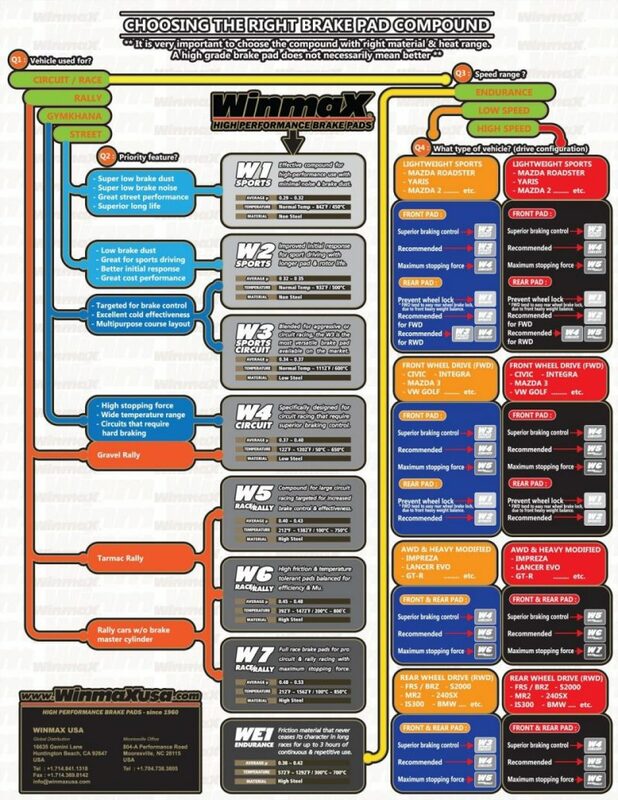 Winmax has done a great job laying it out in charts so you can see the difference in compounds. If you have any questions please feel free to contact us. 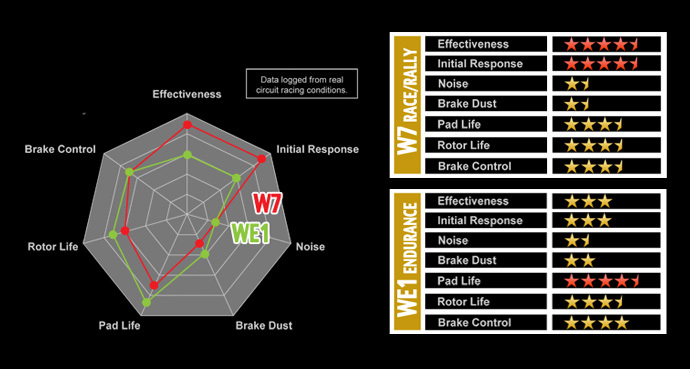 Honestly here is what Winmax USA’s W-Series line of brake pads provides for FRS/BRZ owners and respective application. 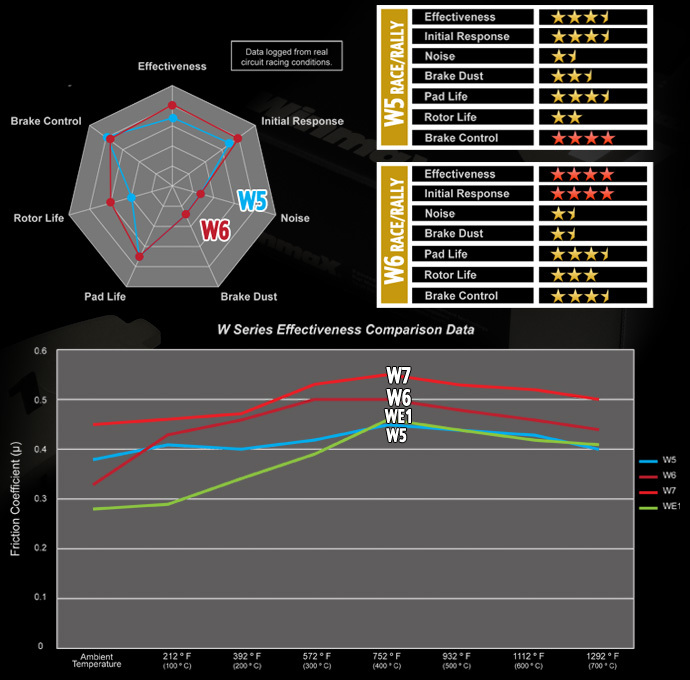 What the W1 will do for you is prevent this type of fade and while slight fading can be expected for street application brakes from high temps, the fade rate is much more consistent, predictable, and will not fall apart like the OEM brake pads. The W1 is therefore, made for those who like to abuse the car a bit further than an average consumer of generic cars, and is intended to make the car feel not too much different in day to day use. Compatible with autocrossing on stock or summer radial tires. W2 – The W2 is a step up from the W1. It still provides a very consistent feel of the stock pads, use parameters are the same, where it is mainly designed for street use, but with a lot more overhead and the most sporting of the pads that are still non-metallic. Because it is non-metallic like the W1, it has no significant dust issue or noise levels to be concerned. 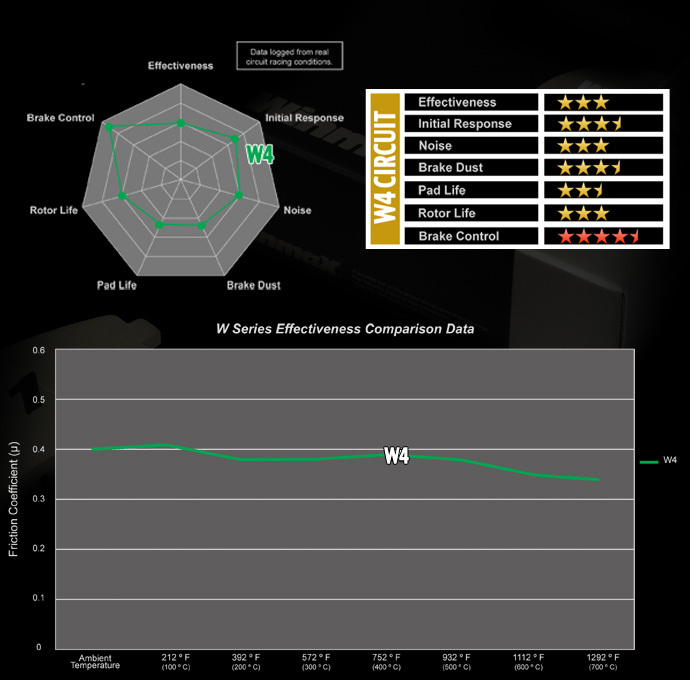 W2 increases driver control feel, a bit more bite, and higher temperature ranges and predictable fall off for when it does fade eventually. You get a slightly better sporting use characters, and endurance, but still without the concerns associated with racing brakes. Perhaps the best I can recommend if you are a typical casual Sunday low speed track folk, or auto-crosser, and still predominantly daily driven car, on summer radials. It is also a good economical upgrade. It’s minimal requirement too, if you are a down-hill canyon enthusiast. W3 – W3 is the most economical grade of so called, “metallic pads” which introduce a ton more braking control, very different bite characters that are more intended for track conditions, and use of race compound tires. If you are an avid track driver, or semi-professional autocrosser, this is where you’d start to see very positive and racing use braking forces. Of course, as with any metallic compound mix brake pads, you will encounter increased rotor wear, noises, and black dusting, and daily driven role becomes more a secondary use. It’s still perfectly safe for street, as long as you can deal with dust and slight noises. Some can, others abhor it… That’s just a choice for what people place as priority. W3 is VERY capable on the Sunday race scene, totally fir for those who use the brakes to 100% capacity, and driving skills to take it there. Autocrossers and canyon runners will feel a new level of control and bite, that extended consistently into very high temperature ranges. It does strike an exceleent balance for those that need a daily driven brake pad, and are not willing to forgo any performance, at cost of a bit of noise, dust, and slightly higher wear rate. 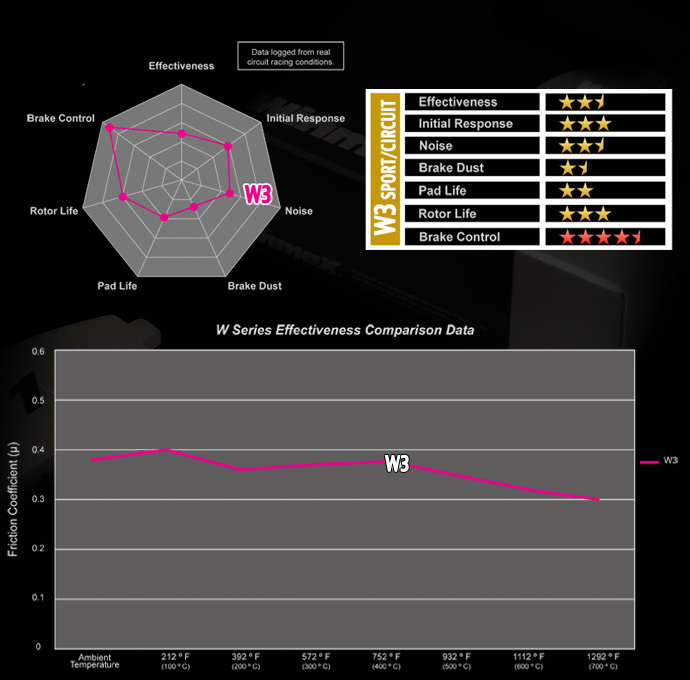 W4 – W4 is similar to the W3, but adds yet a bit more braking bite, and prove a bit more endurance in longer sessions. The W4 will lap consistently, longer than W3 with similar feel. This is also a brake pad that starts to need a bit of caution for daily drivers, as very cold braking does feel slightly looser than at proper temps that is 50~100’c that it needs to be at before it is working as designed. Not an issue once accustomed to it however, even for daily driving. It does however, wear both rotors and pads at slightly higher rate, in exchange for all that super precise braking control and constant bite at all temperatures. While application for other cars with tiny calipers like S2000 or heavier cars like Impreza the W4 is made to feel like the W3. For the FRS however, it does tend to feel a bit leaning towards being track dedicated in use, and cost-performance. W5-W7 – And your question must now be, what is W5~W7? Well they are strictly designed for track dedicated use. These are very highly specialized high-metal content pads that are made for race tire operation, and rally and endurance conditions where grueling braking forces are applied for hours on end. W5~W7 exists in 3 grades for users to balance a preferred character, and also to tailor it exactly to the needs of a particular track, and stage. AS with any brakes, it can be used for the street, but the design intention being very far from this, it will not be a very good candidate for street spec with high levels of wear, and noise, as well as inconsistent performance when they are very cold. These are all about ultimate racing environment, and there in the right elements, they are one of the best, most economical and competitive choices for serious racing teams. Overall though, the Winmax brake pads are typical in feel to other Japanese made pads. Japanese brake pads have a character of its own, and use very exotic materials that are different in some ways than pads made in other regions. Each region/nation has brake pads made from whatever makes business sense due to local availabiltity and costs on the ingredients for friction materials. In the case of Japan, most brake manufacturers including Winmax (parent firm MK Kashiyama) as welll as Project Mu, and Endless are all based in the locale of Nagano Prefecture. They have always been a center for manufacturing of exotic materials, compounds, and ceramic/ metallurgy experts from centuries ago, from pottery, to founding, blending, casting, and forging of various military tools. AS such, the Winmax Brake pads compare closely to those of more established names like Endless or Project Mu, and do feel a bit different than Hawk, Carbotech, Ferodo and similar brands from more mass-marketed European and American pads. While at the peak performance specs, all competing and competent brake pads from various firms can show highest rated-use specs numerically, it is the range of uses below those figures, and how it feels on your feet as driver in controlling that. So while specs may seem very similar just by looking at the catalogs, what should be carefully viewed is the intrinsic of how drivers interact with the brakes is rather non-numerical. And with Winmax W-Series, I think they hit the right balance of product choices, and price-point while giving enthusiasts a chance at getting the feel of sophisticated blends that Japanese brake pads are known for. Bottom line, basically is that while cheaper or more expensive pads will perform to expectations on what is stated on catalogs, but how they feel getting there, is something that is an art of the manufacturers and their craftsmen. For the Japanese made pads like Winmax, there is that character that is unique, and this is really the element where people might pay a premium over less costly ones, or forgo more expensive ones in the same breath. Any good brake pads from any reputable makers is a good choice, as long as you bought what you needed for the intended role, and the choice suffices or exceeds the expectations. Winmax is just one of them among many. The above pad choices are a general guideline, and specific choice for a particular car, driver preference, and combinations for tuning the brakes will vary. Be the first to review “Winmax Brake Pads – 240SX S14” Click here to cancel reply.